Little, Brown, 1962-01-01. First Edition. Hardcover. Good Minus/Good Minus. Good minus 1962 First Edition in price ($3.75) unclipped good minus dust jacket. Binding is solid and pages are tanned but clean. Heavy foxing on page edges. Dust jacket is tanned/faded, soiled, and chipped. 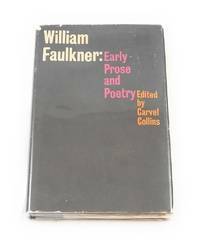 Protected in an attractive, clear, Mylar cover.A great affordable copy for the library of any Faulkner fan!